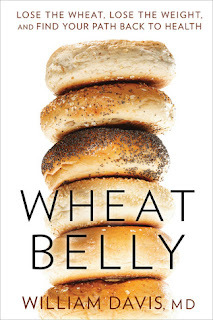 A while ago I read the book Wheat Belly, a groundbreaking book that promotes the fact that wheat is bad for you. Renowned cardiologist, William Davis, MD explains how eliminating wheat from our diets can prevent fat storage, shrink unsightly bulges, and reverse myriad health problems. Every day, over 200 million Americans consume food products made of wheat. As a result, over 100 million of them experience some form of adverse health effect, ranging from minor rashes and high blood sugar to the unattractive stomach bulges that preventive cardiologist William Davis calls “wheat bellies.” According to Davis, that excess fat has nothing to do with gluttony, sloth, or too much butter: It’s due to the whole grain wraps we eat for lunch. At the time, I had just spoken to my doctor about going off Janumet pills which I was taking twice a day to control my sugar and was finding that even by switching to whole wheat bread and pastas, it really didn't help much. What I read in Wheat Belly totally made sense. Dr. Davis' argument is that this is no longer our parents' wheat that is being used in products, the wheat that was grown in the 50s and 60s all around the world. In the 1960s, geneticists managed to change the genetics of wheat being grown to increase a farmers yield. Agricultural geneticists claim was the new wheat still contained all the same properties of the old wheat. However there are extra properties added such as gliadin. It's not gluten. I'm not addressing people with gluten sensitivities and celiac disease. I'm talking about everybody else because everybody else is susceptible to the gliadin protein that is an opiate. This thing binds into the opiate receptors in your brain and in most people stimulates appetite. The doctor also deeply stresses how carbohydrates affect blood sugar. In fact, when Canadian Dr. Fredrick Banting was researching and discovering a cure for diabetes, his original 1922 publication speaks of limiting carbs in diabetic children to just 10g per day. One slice of bread can have 25 or more! Davis talks about a Temple University study of obese diabetics who reduced their carbs to just 21 grams per day. Not only did their blood sugar drop, but there was an average loss of 3.6 pounds per patient in just 2 weeks! After reading this book, my glucose level was between 13 and 14. I got it down to the low 9s before summer, then got lazy. What I found was when I cut out most wheat, I never felt bloated and was less gassy. I have been eating pasta and had some buns lately and my sugar has risen and I feel bloated and gassy. Maybe I should reread the book. 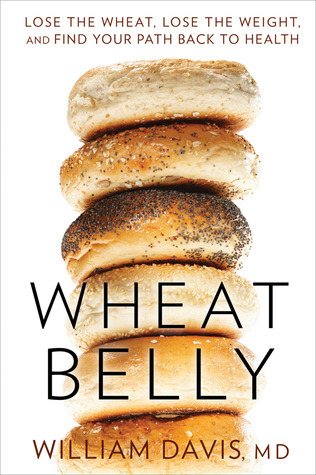 I believe there are a lot of truths in Wheat Belly! I'll be writing more of my experience of getting back on track by cutting out wheat and carbs.